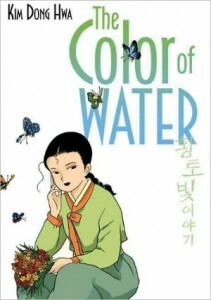 Kim Dong Hwa’s Eisner-nominated “Color” trilogy, The Color of Earth, The Color of Water, and The Color of Heaven (published in English by First Second), follows the life of Ehwa, a young girl in a rural Korean village, as she grows from childhood to adulthood. According to Kim, he began writing The Color of Earth after sitting with his sick mother and thinking about what she might have looked like over the years, tracing her life back to her youth. 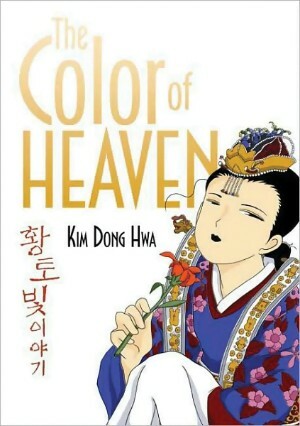 The series focuses heavily on Ehwa’s sexual awakening, from a child’s curiosity to the confusion of young adulthood, as well as her relationship with her widowed mother. The books are filled with poetic language, particularly flower metaphors, as Ehwa’s mother tries to explain to her the nature of men and women. This is often in contrast to the books’ actual subject matter, which can be quite crude. Kim is not at all shy in his portrayal of bodily functions associated with human sexuality, such as menstruation, wet dreams, masturbation, and even discussion of things like “what a man’s seed smells like.” Not that these are all illustrated with the same broad strokes. Ehwa’s first experiment with self-pleasure, for instance, is handled with much more delicacy than a village boy’s constant habit of playing with himself in front of the local girls. The story’s portrayal of women, in particular, has created some controversy (or at least disagreement) amongst critics, and though the series has been praised highly in some quarters–enough to be the first Korean manhwa to ever be nominated for an Eisner award–it has been heavily criticized in others. Stories of first love can be poignant and affecting if done right, but The Color of Earth unfortunately fails in this regard. The problem is that instead of dealing with Ehwa’s growing emotional maturity, the focus is almost exclusively on sexual maturity. From practically the first page, more time is spent on charting landmarks of sexual discovery—oftentimes rather crudely—than on any other aspect of Ehwa and her life. Women are consistently compared to flowers throughout the book, and not in a way that is complimentary. A woman’s burgeoning sexuality is likened unto the bloom of a flower, and comparisons are made between the way a flower waits for a butterfly to alight upon it and the way a woman waits for a man to bestow his attentions upon her. 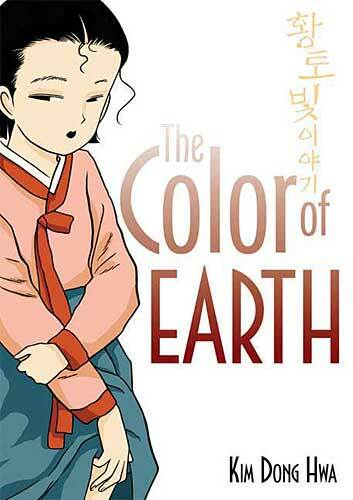 The Color books compose a period piece that traces the sexual comic of age of a young girl in rural Korea. It’s an experience and a transition that the creator clearly reveres, but for me, it was an uncomfortable kind of reverence. It’s reverence with a degree of distance that seems to flatten and simplify the experience being rendered; the path from girl to woman is dewy and magical, uncomplicated and pristine, or at least that’s the impression the books left. I feel like it crosses the line between celebratory and condescending. It can get a bit tiresome in places; take this manhwa literally and you might assume that the only thing women talk about amongst each other is men. While this is a perspective of the world that flatters the male ego, it has no relationship to reality. However, inasmuch as the setting, pre-industrialized, agrarian Korea, was intensely patriarchal, the nostalgic, pseudo-poetic way in which mother and daughter discuss human relationships does indirectly explicate the ways in which social selfhood are conferred only upon women who are attached to a man, either as daughter or wife. Although comics and graphic novels come in all shapes, sizes, genres and styles, it’s still the creators in the far east who have had the most success in making comics appeal to women. Just how far this has come in certain corners of the comic creating world is evident in The Color of Earth, the first volume in a trilogy of Korean manwha (comics), which is so appealing, so feminine, so gloriously gentle and pretty and lovable, you could be forgiven for thinking it was a flower. That it was written by a man, and also holds what I believe is genuine appeal for men too (I enjoyed it and I’m a man), is just mind-boggling. That a vision of women as readers who most wish to see themselves portrayed as “gloriously gentle and pretty and lovable” is fairly problematic for many of us surely comes as no surprise. And though this reviewer’s assessment is perhaps not quite fair to the series, it does illustrate one of the many reasons why the Color trilogy should provide some wonderfully vigorous discussion for this month’s Manga Moveable Feast. On a personal note, though I suspect some of my own biases show through in this introduction, I’m thrilled that the Feast has taken on its first manhwa. And despite my own issues with the series, I’m also pleased that the manhwa chosen is one of a handful translated into English that is not visually influenced by Japanese manga. Let the Feast begin!